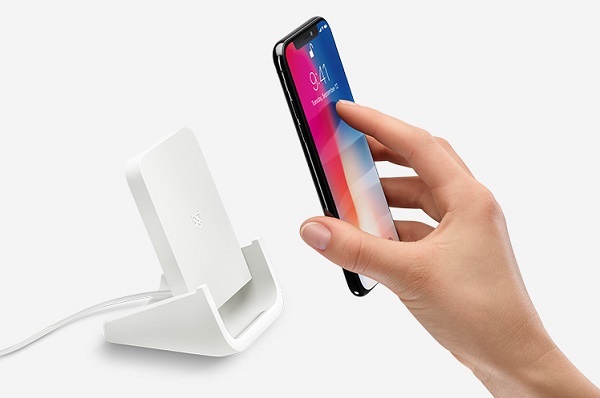 Logitech POWERED wireless charging stand for iPhone 8, iPhone 8 Plus and iPhone X announced. Today Logitech announced the POWERED Wireless Charging Stand. Designed in collaboration with Apple, POWERED is a wireless charging stand for iPhone 8, iPhone 8 Plus and iPhone X that makes it easy to charge and use iPhone at the same time. Whether charging in portrait or landscape mode, POWERED allows for convenient placement. POWERED makes watching a video, reading a recipe, keeping track of your notifications or talking via FaceTime a cinch iPhone is comfortably positioned on the stand to charge. The rubberized u-shape cradle keeps iPhone stable even with a protective case up to 3mm thick, so it's safe and continuously charging. Qi-certified and optimized for iPhone, POWERED has a built-in overheat protection system that helps regulate temperature. POWERED delivers up to 7.5W charging for iPhone 8, 8 Plus, and X only and up to 5W charging for all other Qi-enabled devices. The LED on top gives confirmation that iPhone is charging while staying hidden behind the phone so the light doesn't become distracting. POWERED is expected to be available in August 2018 from for a suggested retail price of $69.99.